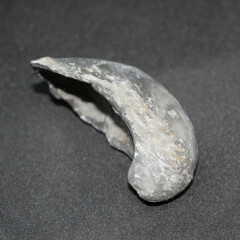 Bivalve fossils are the shells of ancient sea creatures, which typically resemble their modern day counterparts. Information about the fossil Bivalves. Bivalves are comprised of two hinged bowl shaped shells connected together, with the soft organic matter protected inside – they are attached to each other by an elastic tissue. In fossil terms, of course, the connective tissue is very rarely preserved – so most pieces are found as a ‘half’. They are some of the most common fossils, especially Gryphaea, which can be found all over the UK – I have picked hundreds of specimens out of normal household gravel. Many closely resemble living marine and freshwater creatures, which still thrive today – many modern sea shells are members of the Bivalve family. They have been around for over 500 million years, first appearing in the Middle Cambrian. Spirituality and Crystal Healing with fossil Bivalves. 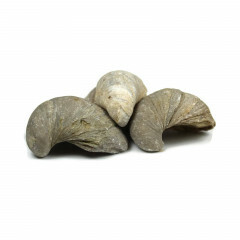 While Bivalves are not typically used for crystal healing, there is a lot of folklore connected to Bivalves, particularily so regarding ‘Gryphaea’, which are commonly known as “Devils Toenails” – as people believed they were the clippings of the Devils toenails. It’s understandable, in a way – some do look like very thick curved nails. There are 17th and 18th century accounts believing that the fossil would cure arthritis.